Sophie is nearly 20 months old and today she is rather grumpy (which is understandable) because she is teething (again). Her first tooth came through just after Christmas 2013 when she was 6 months old. Like all children, teething has been on and off since then. It does feel like it's never ending sometimes! I thought I would let you know the product we use. It seems to be the only thing that helps her and she actually lets us apply it. We tried all the gels, teething sachets etc. which didn't seem to make any difference whatsoever - until someone recommended Anbesol Liquid. You can buy it from most pharmacies, including Boots and also in supermarkets such as Asda and Tesco. It's an antiseptic and anaesthetic, you just put a bit on your finger and apply it twice where it is needed and it should provide almost instant relief. It can also be used by adults for 'recurrent mouth ulcers and denture irritation' too. I have lost count how many times I have recommended this product and they all swear by it now too! 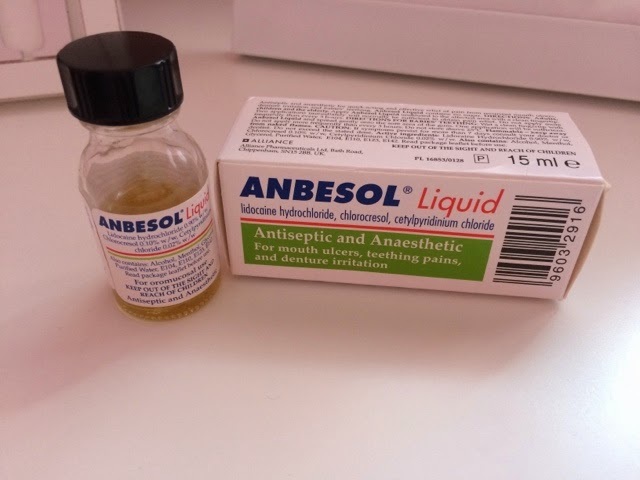 Have you used anbesol? Does it help? Let me know!